News outlets are reporting that Arlene K. Marshall, a 69-year old St. Charles woman, was killed in St. Charles early Friday morning while crossing Main Street (Rt. 64) and North Second Street (Rt. 31) in Downtown St. Charles. A police investigation has determined that Arlene K. Marshall was killed when the wheels of the dump truck struck her as it turned right onto North Second Street from westbound Main Street. At the time of the impact Arlene K. Marshall was pushing her bike across Main Street. This is an area I am very familiar with after having grown up and spending many days along the Fox River. The location of the accident is immediately south of the Fox River in the very center of downtown St. Charles.This intersection also has crosswalks across all four corners of the intersection (click here for an image of the intersection). The Illinois law was recently amended to require motorists to STOP for pedestrians in a crosswalk. Based on the news reports, it appears that the dump truck not only didn't stop for Arlene K. Marshall but didn't yield either. Attorney Mike Keating of Keating Law Offices provided pro bono legal consultations and lobbying efforts to assist in the Illinois law changing from requiring motorists to stop instead of just yield for pedestrians in a crosswalk. Attorney Mike Keating has extensive experience in handling motor vehicle related accidents and wrongful death cases in Kane County and the surrounding areas. He is currently handling numerous cases in Kane County and recently successfully resolved a motor vehicle vs. pedestrian wrongful death case involving a 3-year old boy in Aurora. 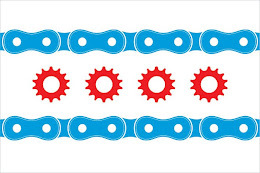 If you have any questions regarding this post of the Illinois laws as they relate to motor vehicle accidents or wrongful death, please contact Illinois Bicycle Lawyer Mike Keating at 312-208-7702 or MKeating@KeatingLegal.com.